If you haven’t noticed by now, I haven’t written an NBA Finals preview and after the way the Eastern Conference Finals ended I planned not to. As a Celtics fan I’m still bitter about how that series ended and how this era of Celtics basketball ended. This was more than just the end of a lockout-shortened season for my favorite team, this was probably the final chapter for what has really been the “Big Four” for the Boston Celtics since the summer of 2007 when Kevin Garnett and Ray Allen joined the team to compliment team captain Paul Pierce. Little did anyone know that pesky little point guard Rajon Rondo would develop the way he did after these two superstar acquisitions, but #9 did and he really should be included in the history books as the fourth cog in this Celtics unit over the past 5 years. The tragic game seven ending of this season hurt more than any season I can ever remember as a Boston Celtics fan. I was born in 1986 and missed Larry Bird’s final championship with the Celtics by a few short months, so what this team accomplished in 2008 was my first banner memory for the boys in green with “Boston” written across their chest. Saturday night’s loss hurt even more than the 2010 NBA Finals game seven when the Celtics couldn’t grab a rebound to save their life in squandering a late lead to the rival Los Angeles Lakers. 72 hours later and I still don’t even want to talk about that horrific game, so instead this post is about “Ubuntu” and what the Celtics have meant to the true sports fans of the Boston area over the past several years. The 2006-2007 Celtics went a miserable 24-58 with Delonte West, Ryan Gomes, Gerald Green, and Theo Ratliff playing considerable minutes and as such, many fans in the New England area were not very optimistic about their chances for the upcoming season. To make matters worse, the Celtics with the second worst record in the NBA were in a prime position to select highly touted center Greg Oden (seen as a once in a generation center at the time) or at worst Kevin Durant (the now 3-time scoring champion, at age 23) and obviously missed out on that as the Celtics ended up with the 5th pick in the NBA Draft and selected Jeff Green out of Georgetown. One day later the Celtics traded the rights to Green, along with Delonte West and Wally Szczerbiak for former UConn guard Ray Allen and Glen Davis (the 35th pick in the 2007 draft) and the transformation of this team had begun. Just over a month later, on July 31, 2007 the C’s pulled off another blockbuster acquiring Kevin Garnett in exchange for Al Jefferson, Ryan Gomes, Sebastian Telfair, Green, Theo Ratliff, cash, and two first round picks. That may sound like a lot to give up for one player, but let me tell you, #5 was worth it. 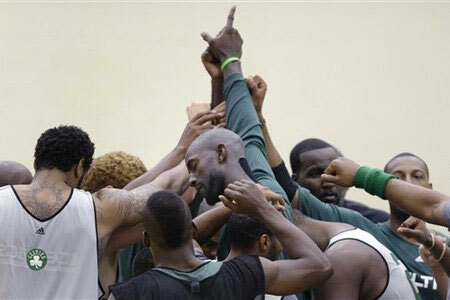 The 2007-2008 Celtics bonded during a trip to Rome, where “Ubuntu” was implemented with the leadership of Kevin Garnett. In the African tradition, Ubuntu is a humanist philosophy that focuses on relationships and allegiances between people. It roughly translates to “I am what I am because of who we all are” and in sports terms that pretty much means “I am nothing without my team”. During that trip to Rome the Celtics organization had no cell phones, no computers, and basically no contact with their world in the United States so they really came together as a team. It was probably the best thing that happened to the Boston Celtics organization since Red Auerbach smartly traded for Bill Russell after the 1956 draft. As everyone who follows basketball knows, the Celtics finished 66-16 during the 2007-2008 regular season and carried that momentum throughout the 2008 NBA Playoffs where they eventually met Kobe Bryant and the Lakers in the NBA Finals. The Celtics dispatched the Lakers in 6 games in those Finals, led by Garnett, Pierce, Allen, Rondo and Kendrick Perkins and raised banner number 17 in the Boston (TD) Garden to begin the next season. To Boston though, this was more than a championship, it was a sign of hope and Kevin Garnett’s “Anything is Possible” declaration resonated with the city of Boston and truly every sport fan in the New England area. I’m not going to say that the 2008 NBA Championship meant as much to New England as the 2004 Red Sox World Series championship, but dadgum it was pretty close. In the 2008-2009 NBA playoffs the Celtics were bounced by the Orlando Magic who ended up losing the NBA Finals in 5 games to the Lakers, but the Celtics bounced back in the 2010 season and made a return trip to the NBA Finals to face the Lakers one more time. Unfortunately, early in game six of that series Celtics center Kendrick Perkins suffered a severe knee injury which left the Celtics vulnerable on defense and rebounding. Perk’s injury shifted the momentum in that series and the hated Lakers ended up taking that championship in seven games, but that season truly made this Celtics team one of the most memorable teams in Boston history. The Celtics never sniffed the NBA Finals again after that series, but nonetheless they will be one of the teams that I never forget. In the 2011 and 2012 playoffs the Celtics were knocked out by the Miami Heat, but it was easy to forget that after Dirk Nowitzki won the 2011 championship. If Kevin Durant and the Thunder can win this NBA Finals I will rest easier, too. Not only will I remember this Celtics team for bringing home the NBA leading 17th banner (unfortunately tied by the Lakers with their 2010 championship), but this team does have personal meaning to me. Somehow, after that championship, I managed to turn a good friend into not only a Celtics fan but into a Boston sports fan. Kevin Garnett had a whole lot to do with that, and I owe a huge debt of gratitude to him for that. Besides that, the Celtics run that year and all the playoff drama every year since has really turned me into more of an NBA fan that I ever was before. I’ve always been one to watch every Celtics game that I could, but over the past few years I have become more of an overall NBA fan than ever before. Maybe that has to do with more players that I’ve watched play college basketball start to excel in this league, but I have to think that the Celtics making deep runs into the playoffs have played a huge part in me starting to love the National Basketball Association even with its prima donna athletes. To tell you the truth I’m still pretty upset after the way the Celtics 2012 season concluded, and I still get depressed thinking about what could have been. As Nike basketball’s advertisements tell you though, “basketball never stops” and tonight the Heat and the Thunder are involved in a pretty darn good basketball game in game one of the NBA Finals (on ABC if you’re reading this). I wish I had more than a passive interest in that game and that series, but with the conclusion of this Celtics series I don’t have a heavy interest in what goes down in that NBA Finals, I’ll be disappointed either way. This Celtics squad has been more than a team for the past 5 seasons and unfortunately all good things must come to an end. Kevin Garnett and Ray Allen are free agents as soon as the NBA Finals are over and I don’t see Boston retaining the services of either of those players, but tonight I’d rather look back and celebrate what this team has accomplished. Pierce and Rondo are both free agents after next season and who knows what happen there, all I know is that this “Big Four” will be broken up. Kevin and Ray, thank you for bringing back Celtic Pride. This Celtics squad has meant more to me than any basketball team probably should, and I know that I’m not alone in that sentiment. I’m proud to be more Causeway Street than South Beach and to know the meaning of loyalty and devotion. Go Celtics, baby! This entry was posted in NBA and tagged Basketball, Boston, Celtics, NBA, Sports, Ubuntu. Bookmark the permalink.